Posted on Wednesday, March 13th, 2019 at 7:21 pm. In the early history of art in hospitals in the United States, the art was primarily religious in nature. However, during the Great Depression art in hospitals changed dramatically. 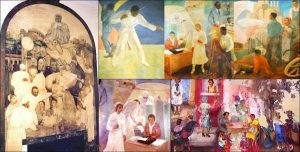 Restored murals in Harlem Hospital are an example of this transformation. The murals were created by African American artists Vertis C. Hayes, Charles H. Alston, and Georgette Seabrooke, and Italian-born American artist Alfred D. Crimi. They executed the murals in modern styles, and the subject matter ranges from the history of medicine to African American heritage. Harlem Hospital murals. Courtesy of Beautiful New York. The murals reflect and address the context in which they are situated. They forge a sense of pride and connection between the hospital, the community, and the country. They were commissioned as part of the Federal Art Project of the Works Progress Administration and are among the few extant hospital murals from the program. WPA poster designed by Vera Bock. 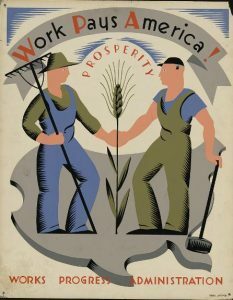 The Works Progress Administration (WPA), later Works Project Administration, was created by President Franklin D. Roosevelt in 1935 and lasted until 1943. The program was created to provide employment and infrastructure throughout the United States. During the years it was active, it employed 8.5 million people. This included creatives such as writers, actors, and visual artists. The program was the first federal government patronage of the arts in the United States. It was also a recognition of art as a worthwhile vocation. The Federal Art Project (FAP) of the WPA employed visual artists to inspire people and give them hope during the difficult times of the Great Depression. Art and artists were brought into communities throughout the country. By 1938 it existed in 48 states; and it resulted in over 100,000 works of art in post offices, schools, airports, and hospitals. Visual artists of various levels of experience and working in diverse styles and genres joined the FAP. Artists could join one or many of the divisions, which included murals, easel paintings, photographs, posters, and sculptures. 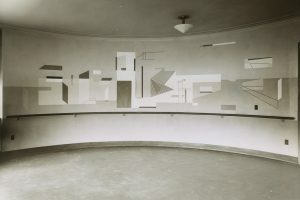 Murals found in hospitals and other spaces were designed by one or two artists for a specific place and executed by a team. Some of them were created on site, while others were painted on large canvases and then installed. Many muralists worked in a realist style inspired Mexican muralists Diego Rivera, Jose Clemente Orozco, and David Siqueiros. 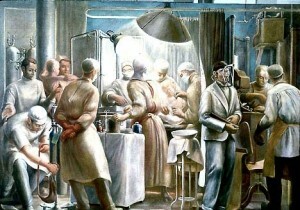 They portrayed scenes from American life with a focus on shared values and progress like those found in Harlem Hospital. Not all hospital murals used realism to communicate social messages. Ilya Bolotowsky was co-founder of the American Abstract Artists Association and a member of the mural division of the FAP. In 1940, he was commissioned to create a wall-painting for the Men’s Day Room of the Chronic Diseases Hospital on Welfare Island (later Goldwater Memorial Hospital, Roosevelt Island). He called the work Abstraction. The images, which he painted on canvas and attached to the curving wall of the day room, were evocative of sailing. Ilya Bolotowsky, Abstraction. 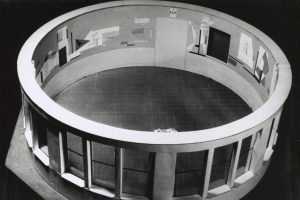 Photo: Collection of the Public Design Commission of the City of New York. Ilya Bolotowsky, Model for Abstraction. Photo:Collection of the Public Design Commission of the City of New York. Bolotowsky wanted to create “serenity and poise” through the mural. He apparently succeeded in creating a calming environment, as doctors supposedly realized that the mural kept patients quiet throughout the 1940s. The hospital was demolished in 2014, but the mural survives on the Cornell Tech campus that took its place. The WAP split public opinion at the time. Some saw it as a waste, particularly the art program. However, many artists who worked for the art program went on to become significant in the history and development of American art, particularly in the post-World War II years. Including the artists mentioned above, artists such as Jackson Pollock, Lee Krasner, Mark Rothko, Jacob Lawrence, Alice Neel, and Louise Nevelson contributed to the efforts of the FAP. While the philosophies and approaches have changed, the significance of art’s impact on the emotional and mental states of people implicit in the FAP program continues to guide the selection of art in hospitals, and increasingly in other public and private settings. Art is more than a decorative accent, though it is important to create a cohesive spatial composition as Bolotowsky did with his mural. It is an aesthetic means to educate, promote positive emotions, connect community, and strengthen culture. Richard Cork, The Healing Presence of Art: The History of Western Art in Hospitals. New Haven: Yale University Press, 2012, p. 383.